Small in size, simple to use and easy to operate, the Air Sampler 1000 Series is ideal for personal sampling applications. Only weighing 0.55 lbs. this provides a flow range between 1000 – 3000 ml/min. The 1000 Series allows for constant flow correction even with changes in ambient temperature and barometric pressure through our ultra-quiet rotary vane vacuum pump technology. 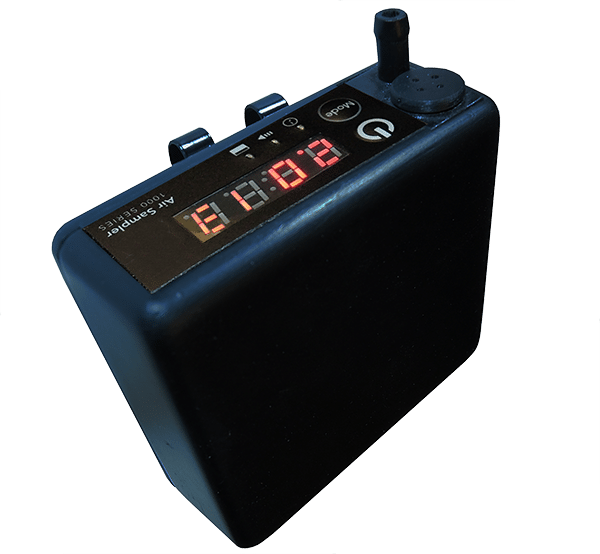 The easy to read LED display provides accumulated sampling volume and a battery conservation mode after 30 seconds of idle use allowing for over 8+ hours of continuous sampling. The power switch allows for easy operation including Continuous Sampling, Volume Reset and Battery Conservation Mode, with the push of a button.